Termites can devastate your home if left unchecked. It doesn’t take them long to chew through structural beams and cause extensive damage. Getting a regular termite inspection near Mesa to catch the problem while it is still manageable. You’ll save your house a lot of damage and save yourself a lot of money. Nematodes are parasitic worms that love to munch on termites. You can buy these tiny worms online or in specialty stores. You can then release them into the area where you know (or suspect) that termites have settled in, and they will go to work for their lunch. The nematodes will reproduce and continue to seek out termites until they are all gone. They are very efficient at getting rid of termites if you introduce enough of them to the colony. Vinegar is the wonder material for your home. Not only can you use it to clean everything from your kitchen counter to shower, but you can also use it to kill termites. Just mix up a half a cup of it with the juice from two lemons, and you’ve got your termite killer. Put it in a spray bottle and spray the mixture around the area where you suspect the termites. The acidic substance will kill the termites on contact. Make sure you spray regularly to catch any termites you didn’t get with the last treatment. Sodium borate, sold commonly as borax powder, can kill termites – as well as wash your laundry. You can either sprinkle the powder around the affected area, or you can mix it with water and spray it into an area that you believe to be infested. As with the vinegar, you will need to reapply the solution to ensure that you are reaching more of the colony. Orange oil is made mostly of d-limonene, which is deadly to termites. The oil is derived from orange peels, and you can buy it from home improvement or garden stores, as well as online. Orange oil causes the exoskeletons of termites to dissolve, which causes them to lose moisture and proteins and then to die. Spray the oil directly onto termites or on areas where you suspect termites to be. You can also spray the oil to deter termites from coming into the area. Therefore, spraying it regularly is a good way to keep your home free of termites, whether you currently have any or not. Termites love twothings: Water and cellulose. Spray down a piece of cardboard with water, and you will be setting out an all-you-can-eat buffet for termites. Why would you want to do to this? Well, if you think that termites are already in your house, putting down this cardboard bait will lure them out and onto a specific spot. When you see that termites have settled in for the buffet, you can take the piece of cardboard away and burn it, killing all the termites with it. Repeat the process as often as necessary to draw out termites. Termites hate sunlight. In fact, they can actually die if they are exposed to too much sunlight and heat. If you have a piece of furniture you suspect to be infested with termites, you can drag it out into the yard to bake in the Arizona sun for a bit. In the summer months, it shouldn’t take too long for all those unwanted pests to be free of your furniture. If you have termites in your home’s structure, you can’t exactly drag your beams out into the yard. But you can set up UV lamps to shine on the area and get the same results. Ideally, your home would have been protected with a perimeter barrier while it was being built. But if it was not, you can still install one, even though it might be a bit labor-intensive. You will need to dig a small trench around your home to put the barrier in the ground. When the appropriate materials are installed, the barrier can keep subterranean termites from tunneling their way right to your Arizona home. The best way to treat a problem is to make sure the problem never occurs. Instead of trying to find ways to get rid of termites, look for ways to keep them from getting into your home in the first place. Regular Mesa termite inspections can help you keep tabs on the situation. But you should also make sure to keep wood, cardboard, and other cellulose away from your home – such as extra lumber in the crawl space, firewood stacked up in the garage, or even untreated mulch in the bed by your door. You should also keep moisture out of your home by ensuring that you have proper ventilation, as well as proper drainage in the landscape around your home. Use one or more of these natural techniques to keep termites out of your Arizona home and to protect your investment. While these treatments are best for small and isolated infestations of termites – such as a new infestation in a piece of furniture or a pile of firewood that you don’t want to spread – you are unlikely to have success using these treatments for termites in your home. The reason is that termites can quickly dig deep into spaces you can’t see or reach. The best thing to do is to call the professionals for termite control in Mesa. 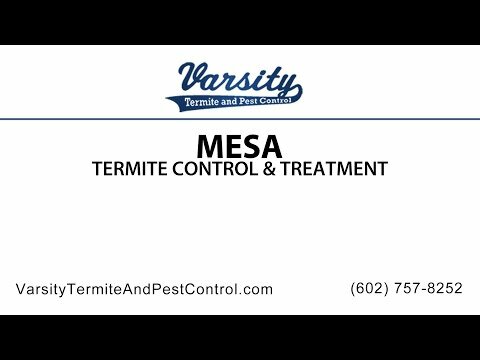 Varsity Termite and Pest Control offers natural yet effective termite treatments in Mesa and the surrounding area. Contact us for a termite inspection, and we’ll create a termite control plan that will not only eliminate any termites currently in your home but will also prevent future infestations.